When it comes to treating Obstructive Sleep Apnea, there are now more options available than ever. Two of the most popular treatment options are Continuous Positive Airway Pressure (CPAP) Therapy and Oral Appliance Therapy. There are several variations of both products. For instance, CPAP Therapy may include a number of different types of machines including the Bi-level Positive Airway Pressure (BiPAP) and Auto-adjusting CPAP (APAP). Oral appliance therapy typically includes either a Mandibular Advancement Device (MAD) or Tongue Stabilizing Device (TSD) sometimes referred to a Tongue Retaining Device (TRD). While all of these acronyms may seem a bit intimidating, it’s really not as complicated as it may seem. Continue reading to learn more about these treatment options and the pros and cons of each. In the end, we will make a comparison between the two and tell you which one is better. The most basic option for treating sleep apnea is the use of CPAP therapy which involves a machine that blows air through a tube and into a mask that is worn throughout the night. This pressurized air combats obstructive sleep apnea by blowing air down your airway at a pressure that is predetermined by your doctor. Generally speaking, the more severe the obstruction, the greater the force that will be required to clear the obstruction. This forceful air opens the airway and creates an unobstructed path which allows air to travel. CPAP machines have been considered the ‘Gold Standard” for several years now and are most commonly prescribed by physicians. The BiPAP machine is similar in nature to the CPAP but does offer one key feature that you do not receive with the CPAP. As the name implies, there are 2 (Bi) separate pressure settings that are set which allow you to breathe more naturally. With a CPAP, one constant pressure setting is blowing at you non-stop throughout the night. While this constant pressure effectively opens the airway while inhaling, exhaling becomes works against your lungs while breathing out. The settings are typically set to an inhale pressure and an exhale pressure with the inhale pressure typically being stronger than the exhale pressure. Those who have used a standard CPAP machine and switched over to a BiPAP often report a higher level of comfort as they are not fighting against the machine while exhaling. The APAP function is fairly self-explanatory. It constantly monitors your breathing and makes an adjustment “automatically” to correct an obstruction. APAP machines are by far the most advanced machines available as they are able to make adjustments on the fly to account for issues such as weight gain/loss, change in position or alcohol an sedative use. Generally speaking, APAP’s are typically issued to those with severe OSA. The Mandibular Advancement Device (MAD), also commonly referred to as a Mandibular Advancement Splint (MAS) utilizes a concept that is completely different from the CPAP type machines. The device consists of an upper and lower plastic tray that is molded to fit the mouth precisely. The lower tray is connected to the upper tray in order to form the mouthpiece. The trays are typically adjustable which allows your dentist to fine-tune the device to suit your needs. In order for a MAD to work, it must restrain the jaw in a forward position which pulls and holds the muscles surrounding their airway. This relieves pressure on the airway and permits one to breathe without obstruction. If the lower tray of the mouthpiece is not adjusted far enough forward, it will not be effective. When this occurs, a qualified medical professional can make adjustments in order move the lower tray forward which will offer further advancement of the jaw. MAD’s have been used to treat obstructive sleep apnea for nearly three decades now and are becoming an increasingly common treatment option for those with obstructive sleep apnea. The Tongue Stabilizing device (TSD) also known as a Tongue Retaining Device (TRD), is a different type of mouthpiece that is used to perform the same function as a MAD. With the TSD, a small device, which somewhat resembles a pacifier, attaches to the end of the tongue using a suction bulb device. The patient squeezes the bulb, places their tongue inside and allows the device to pull the tongue into place. With a TSD, the tongue is held forward and it essentially performs the same function as a MAD which is to hold the muscles surround the airway open. TSD’s are a newer technology that has been scientifically proven to be just as effective as a MAD. One advantage that a TSD has over and MAD is the fact that they are sort of a one-size-fits-all type of product which can be used straight out of the box with no special modifications necessary. If you have spent any time researching Oral Appliance, you have likely come across several over-the-counter type products that are collectively referred to as “snoring mouthpieces”. You have probably looked at the appliances that are fitted by a doctor and then the DIY style mouthpieces and wondered exactly what the difference between the two. They are very similar in appearance although one costs several hundred dollars more than the other and requires going to a dentist to have it fitted. Essentially, they are identical when it comes to function. They both hold the jaw forward to clear the airway. However, the similarities end here. The primary difference between the two has to do with the intended use. 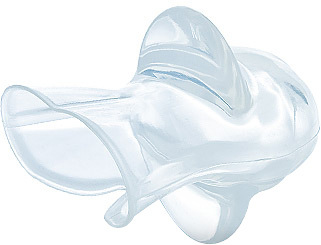 A snoring mouthpiece is used to treat benign snoring which does not include OSA. 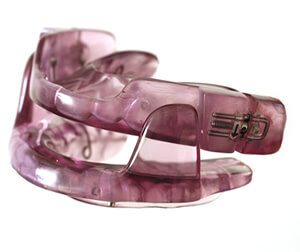 Professionally fitted MAD’s are used to treat obstructive sleep apnea. It boils down to this: simple snoring does not cause any harm while OSA is more serious and requires the care of a physician to ensure that it’s being used correctly to prevent apnea events. If you believe that you have sleep apnea, visit a qualified medical professional who can assess your condition. CPAP machines, although considered very effective, have a reputation for being inconvenient. There’s the machine itself, a long hose and a mask or nasal pillow. CPAP machines take up space in the bedroom and must be hauled around while traveling.It also requires electricity to operate. They have more moving parts which mean they are more likely to break down. In comparison, an oral appliance is small, compact, and easy to travel with. There are no moving parts although they may sometimes need repair. Oral appliance can fit into your pocket and can be used without electricity. Comfort is a difficult subject when it comes to comparing the oral appliance to a CPAP. The level of comfort experienced by users will vary from one patient to another. There is certainly no shortage of people reporting that their CPAP is difficult to sleep with due to the mask on their face and air constantly blowing down their throat. These people typically abandon use after just weeks or few days. By the same token, there are plenty of oral appliance users claim that their device makes their jaw sore and causes drooling throughout the night. There is no denying that the CPAP is more effective than the oral appliance. In fact, it’s effective in an estimated 99% of cases which is why doctors prescribe it most often. In comparison, an oral appliance is effective somewhere around 75% of the time. Some studies suggest that it’s more effective while others say that it’s less. Determining which product is better should be considered on a case-by-case basis. There is no one-size-fits-all solution for treating obstructive sleep apnea. Those who don’t mind dealing with the awkwardness of a CPAP and are comfortable using the machine may choose to go this route because of its effectiveness. 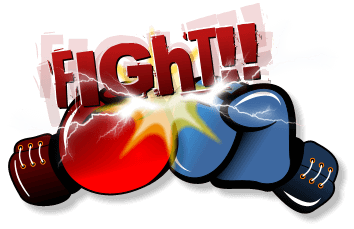 If the idea of dragging around machine indefinitely is getting you down and you are able to tolerate an oral appliance, this may be a better route to go. It’s important to remember that it’s not as effective as the CPAP. Your doctor will be able to help you determine if an oral appliance is right for you. Next post: Laser-Assisted Uvulopalatoplasty to Stop Snoring – What is it and Does it Stop Your Snoring?